Several of the councilors said preserving public access to the shoreline is a principle worth defending. 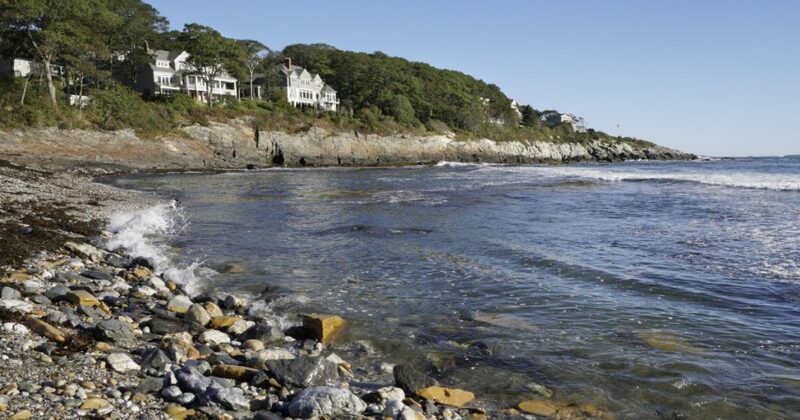 CAPE ELIZABETH — The Town Council on Wednesday night soundly rejected a mediated court settlement with several waterfront residents who have sued the town claiming ownership of an undeveloped portion of Surf Side Avenue. Under the proposed settlement, the Pilot Point Road residents had agreed to pay the town $500,000 to prevent development of a public shore path between their multimillion-dollar homes and scenic Broad Cove. The council voted 6-1 against the settlement, with several members saying they felt compelled to reject the agreement because it didn’t support the principle of maintaining public access to the shoreline. “It is important to ensure access to the ocean for everybody,” said Councilor Penny Jordan, who voted against the settlement along with Valerie Randall, James Garvin, Caitlin Jordan, Christopher Straw and Chairwoman Jessica Sullivan. Councilor Sara Lennon provided the sole vote in favor of the settlement, saying that she believes vacating or giving up the town’s claim to the undeveloped portion of Surf Side Avenue was the best way to avoid a long, costly court battle with a risky outcome. “If we don’t win, we have lost a lot,” Lennon said. Sullivan said she opposed the settlement because she, like many town residents, has long favored accepting the so-called “paper street” as a public way and was concerned that the settlement wouldn’t adequately protect the access rights of Shore Acres residents. 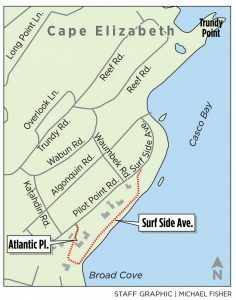 More than 1,400 Cape residents have signed a petition supporting public access to Surf Side Avenue. Garvin, who along with Sullivan and Lennon helped to negotiate the settlement, said he hopes the town will seek an alternative solution that prevents a long and expensive court battle. The plaintiffs in the lawsuit filed in January are Imad and Hulda Khalidi, David and Kara Leopold, Andrew Sommer and Susan Ross, Stewart and Julie Wooden, and Pilot Point LLC, according to the settlement proposal. Each property is valued at $1 million to $2 million for tax purposes. The plaintiffs issued a statement Wednesday night saying they were “extremely disappointed” that the council rejected an agreement that respected property rights and protected fragile coastline, among other benefits. Under the proposed settlement, the residents would have dropped the lawsuit and the town would have vacated any claim to an 800-foot strip of land along Broad Cove. The residents would have assumed ownership of the land and paid taxes on it. Surf Side Avenue first appeared on a 1911 plan for the Shore Acres subdivision, but it was neither completed nor formally accepted by the town. The complaint notes that the property owners have incorporated the paper street into their backyards, installing items such as a wooden deck, a brick patio, a fenced-in garden, an established hedgerow, an irrigation system, stairways, lighting, stone landscaping and fencing. While inland residents of Shore Acres have for decades enjoyed the deeded right to hike along Broad Cove, their newer waterfront neighbors have indicated in recent years that they want to stop the town from extending that right to the general public. The simmering dispute has sometimes flared into neighborhood confrontations, especially after the town’s Conservation Committee identified Surf Side Avenue and Atlantic Place as potential trails in the town’s 2013 Greenbelt Plan. The council decided in October 2016 to extend the town’s right to accept the paper streets for an additional 20 years, but the abutters and some of their neighbors wanted the council to take immediate action. Last fall, faced again with the decision to vacate or accept the paper street, the council voted unanimously to extend the town’s right to accept until 2036 and hire a facilitator to help the neighborhood work through its concerns and inform future council actions. At a pair of public forums held in February, 64 of 84 townspeople who attended said they favored accepting the paper street. The Pilot Point plaintiffs skipped the forums. The proposed settlement drew strong criticism from 12 residents who spoke at Wednesday’s meeting, some of them inland residents of the 115-home Shore Acres subdivision. No residents spoke in favor. A few recalled past decisions to preserve public access and urged the council to reject the settlement offer and accept the undeveloped section of Surf Side Avenue as a public way. “Please do not give away one little bit of public access,” said Deena Mayo of Two Lights Road.